N Hariharanadha Sarma, N Jeebun, R Srivastava, S Agnihotri, V gopalakrishnan. Primary Angiomyolipoma Of The Ovary. The Internet Journal of Pathology. 2006 Volume 6 Number 2. Angiomyolipoma is a benign tumor seen in the kidney and in many cases associated with tuberous sclerosis.Extra-renal angiomyolipomas have rarely been reported in various other organs. Primary Ovarian Angiomyolipoma appears to be the first case to be seen in the ovary.Tuberous sclerosis is not seen in this case. Angiomyolipoma is a benign tumor of the kidney characterized by the presence of variable mixture of blood vessels, smooth muscle and adipose tissue. Two types are reported; one associated with Tuberous sclerosis and the other without1.Though kidney is the most frequent site of involvement, angiomyolipoma has also been observed rarely in other organs such as liver, colon, lung, heart, nasal cavity and oral cavity2. We present the first case of primary ovarian angiomyolipoma with typical histological features. It is important to identify extra renal angiomyolipoma as the treatment is simple total resection and also to prevent misdiagnosis especially with fine needle aspiration biopsy3. A fifty year old woman presented with increasing heaviness and mild tenderness in the right iliac fossa of one year duration. Clinical examination was suggestive of right ovarian mass. Previous history and family history was unremarkable and examination of the other organs did not reveal any significant changes. Ultrasound examination of the pelvis revealed a solid right ovarian mass. Biochemical and hematological parameters were within normal range. A diagnosis of solid ovarian tumor was contemplated clinically and hysterectomy with bilateral salpingo-oopherectomy was performed. The post operative period was unremarkable and the patient was discharged after complete recovery. The patient was examined thoroughly once again after the histopathology report of Angiomyolipoma of the ovary. The patient was examined for the evidence of Tuberous sclerosis and kidneys were examined by echography and CT Scan for any evidence of primary angiomyolipoma. There was neither any indication of Tuberous sclerosis nor any indication of Angiomyolipoma in the Kidney. The patient has been followed for two years and no recurrence of the tumor was seen during this period. The specimen was uterus with both fallopian tubes and ovaries. The uterus measured 9X5X3 cms. The right ovary was enlarged with smooth surface and measured 12X9X6 cms. The cut surface of uterus, fallopian tubes and the left ovary was unremarkable. The right ovary showed predominantly solid grayish brown areas with occasional small yellowish foci. There were no cystic areas, hemorrhages or necrotic areas. 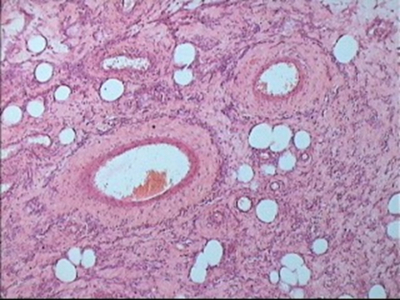 Histological sections from cervix,uterus, both fallopian tubes and left ovary did not reveal any significant pathology. Sections from right ovary showed almost total replacement of ovarian tissue by a tumor consisting of a variable mixture of thick walled blood vessels, haphazardly scattered smooth muscle fibre bundles and mature adipose tissue. The smooth muscle fibres were seen in sweeping fascicles surrounding the adipose tissue. The smooth muscle fibres had elongate spindled nucleus and eosinophilic cytoplasm. The blood vessels were of medium size with thick walls(Fig.1and 2). The immunohistochemical stains for desmin,vimentin,S-100P, actin and HMB-45 were positive. Angiomyolipoma (AML) is a benign tumor which occurs more frequently in women with median age of 46. In about two-thirds of cases it causes symptoms such as abdominal or flank pain, hematuria, or chills and fever. Less commonly it is asymptomatic and is discovered as an incidental finding at operation for some unrelated cause or at autopsy2.The AML can occur as solitary or multifocal lesions with kidney being the most common organ affected. There are possibly two types of AML as reported by many workers4.One form is small, asymptomatic , usually found at the time of autopsy and in association with tuberous sclerosis(TS).Another form is a large symptomatic tumor without associated Tuberous sclerosis.90% of renal AMLs are seen in patients without TS5.Though kidney is the most common location for AML, extra renal AMLs have been seen occasionally. Typical case of AML shows mature adipose tissue,tortuous thick walled blood vessels lacking elastic lamina and bundles of smooth muscle that seem to emanate from the vessel wall. A fourth component which is a variant of smooth muscle cells is often seen in relation with walls of the blood vessels. This component is called as Perivascular epithelioid cell(PEC).These PECs are positive for melanocytic markers such as HMB-45,Mart-1/Melan-1,gp 100 in addition to expected smooth muscle markers like Actin. Many Angiomyolipomas are immunoreactive for CD117(C- Kit) and Progesterone receptors6. Aneuploidy has been found in some of them by flow cytometry and patients with Tuberous sclerosis may show mutation of TSC 1 and TSC 2 genes2. In the present study the AML is seen as primary lesion in the ovary without renal involvement and without TS. The morphology of the tumor in the present study is that of typical AML with variable foci of adipose tissue, thick walled blood vessels and smooth muscle bundles and a few clusters of Perivascular epithelioid cells. There were no atypical cells or bizarre cells and there was no evidence of epithelioid type of smooth muscle cells.To the best of our knowledge this is the first case of a primary Angiomyolipoma of the ovary with typical histological features. The majority of AMLs(60%) are asymptomatic7.In patients with Tuberous sclerosis 82% of patients with a tumor of more than 4 cms size were symptomatic8.The development of abdominal ultrasonography, CT Scanning and Magnetic Resonance Imaging (MRI) in recent years has increased the incidental detection of asymptomatic Angiomyolipomas. When AMLs are symptomatic, the main presenting symptoms are related to intratumoral or retroperitoneal hemorrhage. Other symptoms reported in patients with Tuberous sclerosis are flank or abdominal pain,weight loss, hypertension, fever and nausea. In the present study the patient presented with an ovarian mass and there was no evidence of Tuberous sclerosis. Without Tuberous sclerosis and in the absence of a kidney lesion Angiomyolipoma could not be considered as a diagnosis. No universal agreement exists regarding the follow up of Angiomyolipoma. Because the risk of hemorrhage is greater in masses with a diameter of 4cms or more, the restriction of the follow up to patients with multiple AMLs or to those with tumors of more than 4cms diameter is reasonable. Small solitary Angiomyolipomas of less than 4 cms in size have little growth, less likely to be complicated and do not require follow up unless the diagnosis is in doubt9,10. 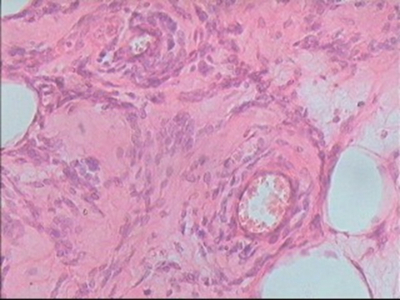 A case of epithelioid type of AML in ovary has been reported which was seen along with multicentric renal AML11.The predominant epithelioid appearance of the smooth muscle cells associated with occasional bizarre or atypical cells can raise the doubts of a malignant nature of the lesion. In fact epithelioid pattern in AML of kidney can be misdiagnosed as renal cell carcinoma. The immunostaining with HMB-45 is useful in these cases which is positive in epithelioid cells. The presence of AML in regional lymphnodes is not considered as evidence of metastasis but considered as evidence of it's multicentricity. AML which is considered as a benign tumor or possibly a choristoma, can be seen commonly in kidney but any organ in the body can be involved, though rarely. It's behaviour and morphology are characteristic of a benign tumor though occasional cases with altered morphological pattern may suggest possible aggressive behaviour. AML is associated with TS in majority of the cases whether it is renal or extra renal in location. AML not associated with TS is likely to be larger in size and become symptomatic. Various immunohistochemical stains are needed to differentiate AML from other malignant and benign lesions. 1. Morgan GS,Straum Flord JV,Hall EJ:Angiomyolipoma kidney.J.Urol.1951;65:525-527. 3. Wadih GE,Raab SS,Silverman JF:Fine needle aspiration cytology of renal and retroperitoneal angiomyolipoma.Report of two cases with cytologic findings and clinicopathologic pitfalls in diagnosis.Acta.Cytologica.1995;39:945-950. 4. Farrow GM,Harrison EG Jr,Utz DC,Jones DR:Renal Angiomyolipoma.A clinico pathological study of 32 cases.Cancer.1968;22:654-670. 6. Henske EP,Ao X,Short P et al:Frequent progesterone receptor immunoreactivity in Tuberous sclerosis associated Angiomyolipomas.Mod.Pathol.1998;11:665-668. 7. Dahnert W.Radiology Review Manual.4th edition.Baltimore,Md:Lippincott Williams & Wilkins;1999. 8. Steiner MS,Goldman SM,Fishman EK,Marshall FF:The natural history of Renal Angiomyolipoma.J.Urol.Dec.1993;150(6):1782-1786. 9. Le maitre L,Robert Y,Dubrulle F et al: Renal angiomyolipoma: growth follow up with CT and/or US.Radiology.Dec.1995;197(3):598-602. 10. Wills JS:Management of small renal neoplasms and angiomyolipoma: a growing problem.Radiology.Dec.1995;197(3):583-586. 11. Anderson AE,Yang X,Young RH:Epithelioid Angiomyolipoma of the ovary.A case report and literature review.Int.J.Gynecol.Pathol.2002;21(1):69-73.